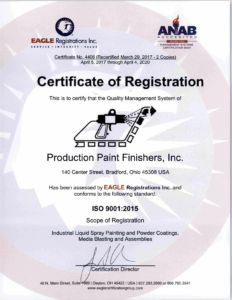 In our ongoing effort to operate at the highest level, Production Paint Finishers, Inc. is proud of our ISO certification and customer approvals. You can rest comfortably knowing PPF, Inc. is properly certified for all powder coating, liquid coating, sandblasting, military (CARC) and commercial projects. Our ISO 9001:2015 certification demonstrates our ability to consistently provide liquid coating, powder coating, military (CARC), sandblasting services and more in a manner that consistently meets our customer and applicable statutory and regulatory requirements. Furthermore, PPF aims to enhance customer satisfaction through the effective application of the system, including processes for continual improvement of the system and the assurance of conformity to customer and applicable statutory and regulatory requirements.